To order bits, leave a message on the contact page, and I will send you my direct email address to discuss your order. Item costs are exclusive of postage and packing. Cost of postage for multiple items will depend upon the weight. Please see Payments Page for details of postage costs and payment options. 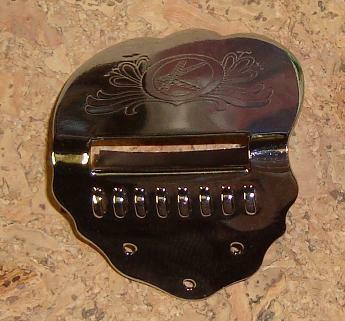 These tailpieces will suit all the floating bridge family of instruments, from the mandolin to the bouzouki. 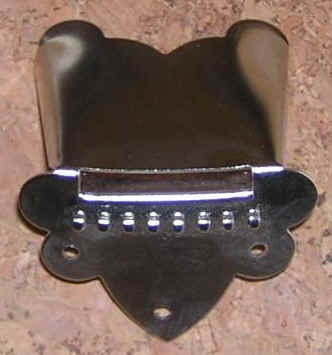 When choosing a tailpiece, the key factors for me are the style of the mandolin and personal preference. However, there is animated discussion in some circles about the effects of different tails on the sounds of the mandolin. Some wish to opt for heavier tails that transfer more of the string vibration to the body of the instrument; others for lighter ones, bowing to the old Italian masters, whose tailpieces were often minimal. Your choice! Perhaps my ears are not what they once were, but changing the tail seems to me to alter the sound not one bit. 8 string hooks and sometimes a strap hook. Inbuilt sleeve guard. Slightly curved. The metal in this piece is 0.5mm thick. 8 string hooks. Slightly curved. 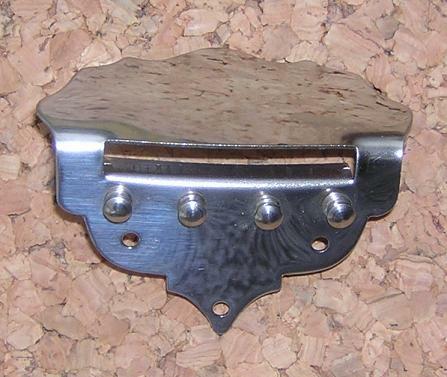 The metal in this piece is about 0.8mm thick and 49mm wide. 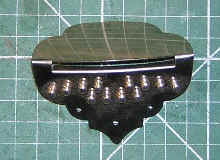 Distance between top 2 screw holes: approx 20mm (centre to centre) 8 string hooks with inbuilt sleeve guard. Slightly curved. The metal in this piece is 0.75mm thick. 8 string posts, curved plate, 70mm wide and 40mm tall. Made in 0.6mm chromed steel..
8 string hooks. Detachable sleeve guard. Slightly curved endpiece. The metal in this piece is about 0.5mm thick. limited stock 8 string hooks. Detachable sleeve guard. 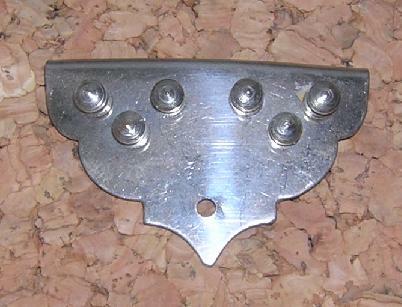 Slightly curved endpiece. The metal in this piece is about 0.5mm thick. 6 string posts, lightly curved, 50mm wide and 55mm tall. Made in 0.8mm thick steel. 4 string posts, lightly curved, 60mm wide and 40mm tall, with inbuilt sleeve guard. 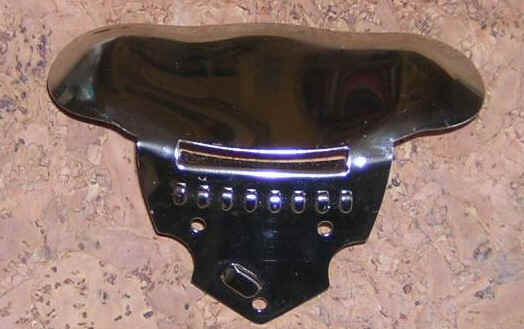 Made in steel approx 0.9mm thick Good solid steel tailpiece with integral sleeve guard. Very slightly curved. 55 wide x 40mm and 0.9mm thick. In all tails, the lower screw-hole may be re-drilled to take a modern end-pin screw. 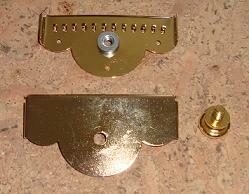 Gold-effect steel, 8 string hooks (left), with detachable cover (centre). 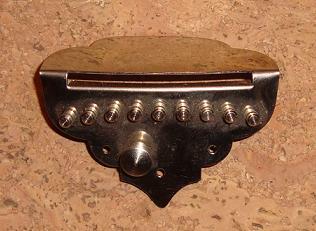 With cover fitted, (right). The metal in this piece is 0.75mm thick. 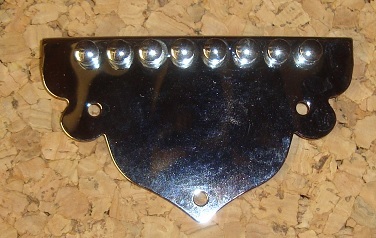 New design in brass, 8 string posts, and sleeve guard. The brass in this piece is now only around 1.5mm thick. 12 string posts and a strap post. Inbuilt sleeve guard. The metal in this piece is 0.5mm thick. 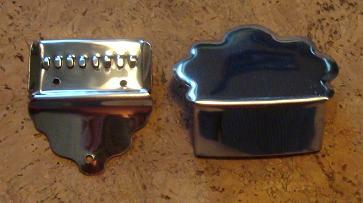 I now have a few more tailpieces with 9 string posts and a strap post. Inbuilt sleeve guard. The metal in this piece is 0.5mm thick.